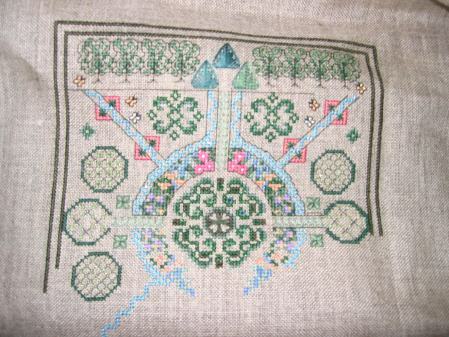 Tonight I finished my rotation on my new focus piece, Liz Turner Diehls German Garden. I had to do some frogging as one of the left hand circle was two stitches too high. I am proud of my progress though. I would love to have this one done by the end of the year. It might be possible. We shall see:) Here it is so far! Alright…off to be pregnant for at least one more day. I have my forty week appointment tomorrow. I am hoping that things have progressed a little more. I am really ready to meet my little guy! Good luck with the 40 week appointment. Hopefully your little guy is close to making an appearance. Love this German Garden so far. Looking forward to seeing the finish, but if you get interrupted that will be ok too. German garden is lookng good. Good luck with your appointment. Lets hope your little man decides he’s ready to see the world very soon. German garden is looking fantastic! I hope all goes well Leslie! Can’t wait to see your baby! The German Garden looks beautiful. Come on baby! I’ll be thinking of you and hoping everything goes well. I don’t know if you’re adverse to inducing at all, but let me tell you, it was a treat with Evie! Your garden looks wonderful!! That class was so fun with you and Margaret 🙂 I am praying for you – come on baby boy!! The garden looks magnificent :). Hope you get to meet your little one soon! The garden is looking really good. Hope the baby comes along soon! The garden looks great. I am so excited for you about meeting your little one. This is going to be amazing. Good luck with your appointment! How exciting it is now, hour by hour….! Your work is really great and congratualtions on your new arrival,I’m sure he will bring you many pleasures. Your LTD is looking beautiful! I hear they’re a real challenge!